This post comes from the heart. Many people in the world, most probably including you and myself, easily judge people by the way they act or how they look or things they do. It may be that it annoys you, antagonises you or you just don't like it. But you don't know their story. So I thought that, maybe you guys could be judging me, you know my name, but you don't know my story... why did I start this blog? Why do I hide away? Why are there hardly any pictures of myself on here? Why am I self-conscious? I am fed up of this. I thought why not explain everything from the start. One of my goals this year was to be brave and face up to some of my fears... So I’m going to do just that. I am going to tell you who I am? Why I have a fear of certain people and just in general a bit about me and the reason why I won't let bullies control my life anymore. My name is Abbie, however I was born Abigail. My name on here... well I normally just sign off with a heart however obviously by the URL my online name used to be absterhamster. This came from my grandma because whenever I eat I stuff it into my checks (tmi I know sorry!) and she always calls me her little hamster so that's where it came from! Yet beginning of 2015 I felt like a needed a change. So my blog was re-designed and I changed my username. This gave away slightly more about me... my name. I felt ever so proud of myself because this was a big step for me, owning up to who I really was online. Yet I still don't have the courage to post a photo directly onto my blog. I started to write my blog because I felt like I could be truly honest with you guys. I feel like nobody is going to judge me on the way I look, if I wear make-up how I do certain things. This is the main reason I am self-conscious. My blog was, still is even my place to escape. A place where I can be myself without anyone knowing who I am. Being anonymous meant no-one could say anything to me at school or judges me; I guess I just liked the feeling. When I started my blog I’d get a few reads on each post, then as I wrote more and more it went up. 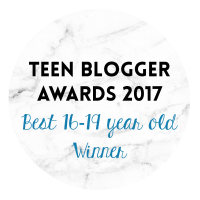 Until now when more people read each blog post than there is in my year group of 12 classes at school, that number is unbelievable to me. This made me realise that if people are enjoying my writing, why not make it more personal. My main scare for sharing my identity I touched on above. Bullies. I was bullied every day for around 3 years. That is one of the hardest things I've ever typed. I was judged on my skin, how I looked, and not wearing 'designer' clothes. You name it; it was probably said towards me. Even though it has stopped, every now and then a few things will be said to me, or I’ll get evil glances across the classroom. Yet I’ve now managed to grow to ignore this. I don't want childish behaviour this year, I want an education. I want to do well so that I can follow my dreams. I want to succeed in life. I feel like this blog post wouldn't be complete without me telling you a little more about myself. Abigail Jessica Turner. That is me... formally known as Abbie. I have brown eyes with brown hair. Yes I’m boring looking! I go to the second largest school in the UK, and have the most amazing best-friends in the world. I love cats especially my own! Monty is a cross between a Tabby and a Manx; he is the fluffiest most adorable little man in the world! Anyway back to me... I have 5 brothers in one way or another, 2 half-brothers (5, 7), 2 Step-brothers (18, 15) and one 'normal' brother who is 13! My parents clearly aren't together. They got divorced when I was 6 but that doesn't matter right now. "Don't let anyone stop you, from doing the one thing you love"